It’s been about a year now that I switched to organic foods. My family has used and experienced the benefits of homeopathy and natural remedies and non-toxic household cleaners for more than fifteen years. 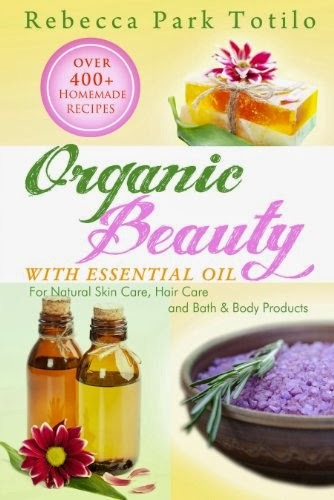 So when I saw this book about creating natural skin care, hair care and bath and body products, I was excited. It’s the one area I still have not looked into too seriously. My 12 year-old daughter has been looking up recipes of facial masks and body cleansers on the Internet so I knew she would love this book. Organic Beauty is a beautiful book. It has a very detailed table of contents, making it very easy to find info. It has colored photos, colored font titles, and pastel-colored boxes with handy tips and recipe variations interspersed throughout the book. There are tons of recipes that can replace ALL of the products in your bathroom, including toothpaste, mouthwash, body scrubs, lip balms and glosses. I must say, I was impressed. It’s clear that the author has a vast knowledge of essential oils and aromatherapy. I’ve always known that commercial products are toxic to my body, (they include parabens that raise the risk of breast cancer) but I also find that natural products are not available everywhere and expensive for the most part. A lot of the recipes in this book include ingredients I found in my kitchen. I had to go out and buy the essential oils, though, because I did not have any on hand, except peppermint. 1. In a small bowl, stir together all of the ingredients. 2. Place the scrub in small containers and give away as gifts or keep for yourself. This recipe was super easy! It took all of 5 minutes to put together. 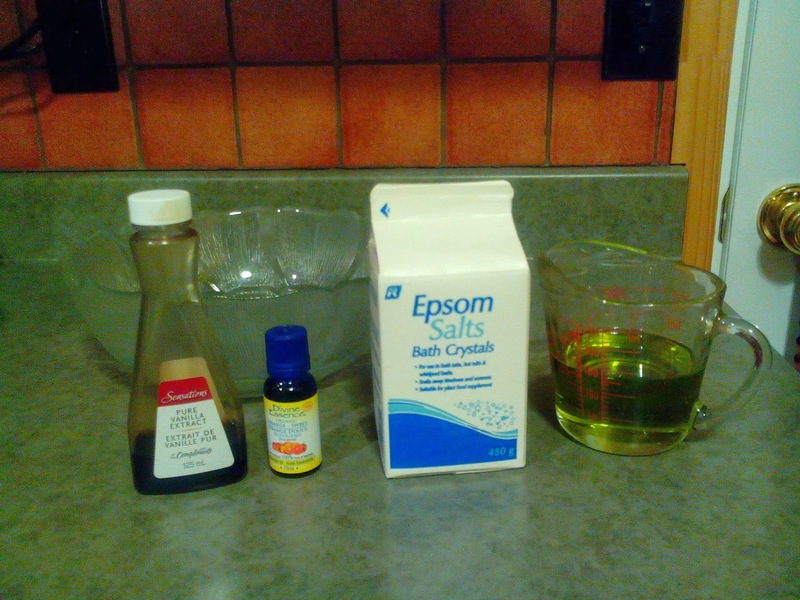 We used pure vanilla extract, the orange essential oil, The Epsom Salt we got at the $1 store and extra virgin olive oil. 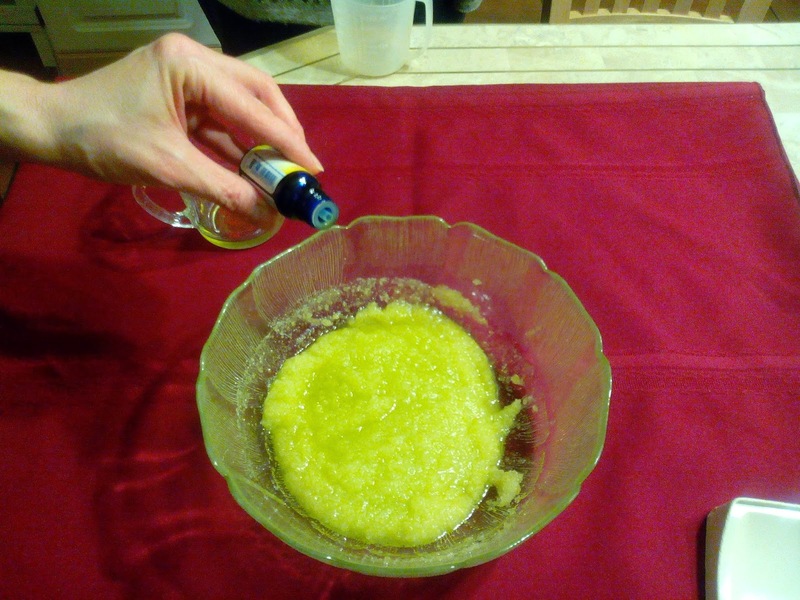 We first mixed in the olive oil with the Epsom salt, and as you can see it made the mixture very green! 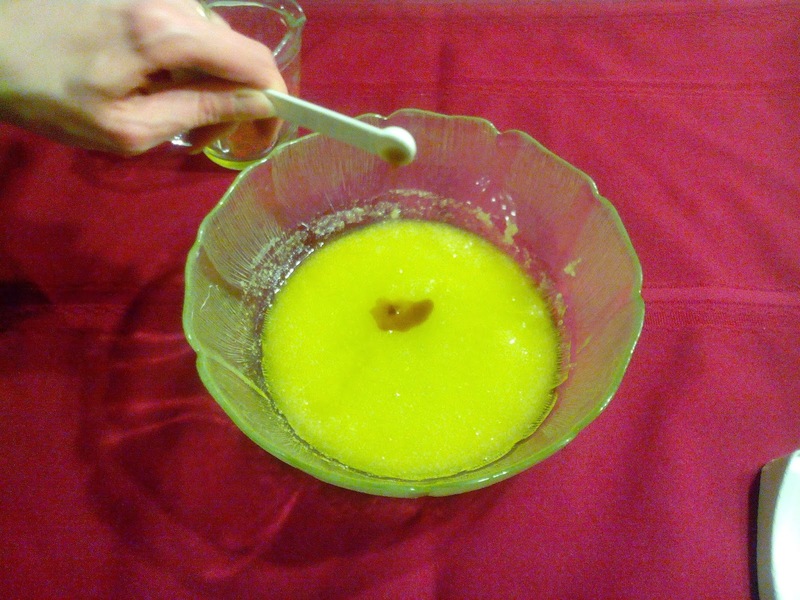 Next we mixed in the vanilla extract. And finally the 4 drops of orange essential oil. I took a tablespoon of the body scrub mixture and scrubbed my very dry chapped hands with it all over and then rinsed them. My hands felt soft and smooth afterwards. 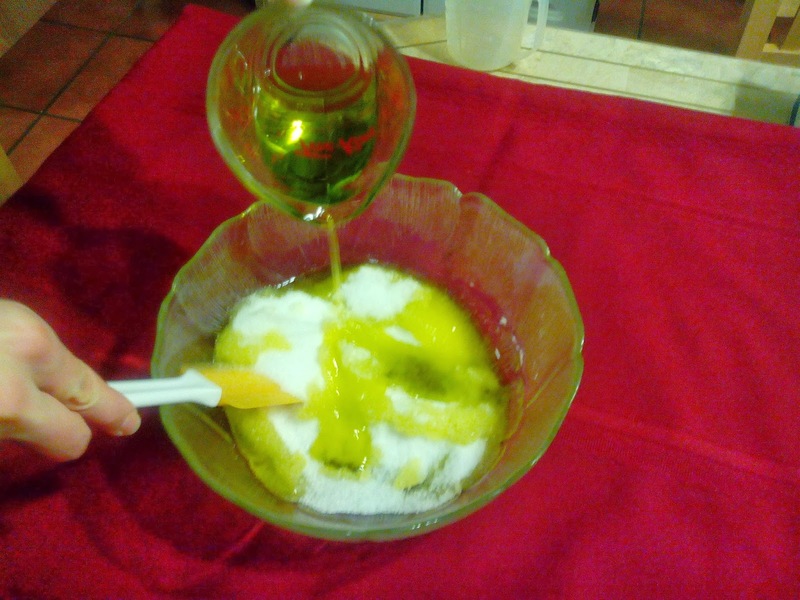 My parents were over when we were experimenting, and my dad--who has rough and calloused hands--did the same thing I did, and remarked that he liked how the scrub left his hands feeling softer and smoother too. 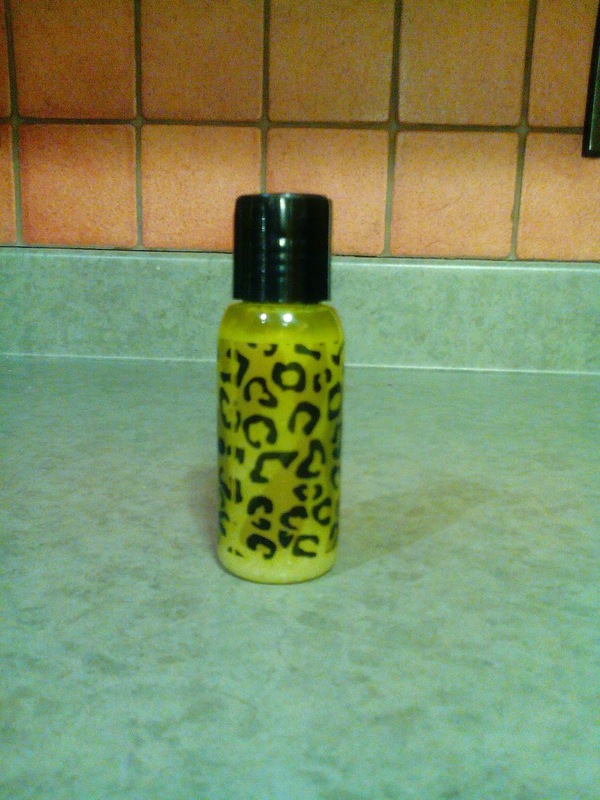 Finally, my daughter used it in the shower and LOVED it. She liked that her skin felt very soft afterward, and she liked the smell too. It wasn't powerful at all. She said that people with oily skin might want to use less olive oil, but for those with dry skin (like she has) it was perfect. She told me she would be using this homemade product again and again. My dad helped my daughter put some in a container using a funnel and a chopstick. We then gave it to my parents to take home to use. They were very pleased! In conclusion, we highly recommend Organic Beauty to all who love body products and want to experiment making their own natural products. The recipes were easy enough and the book is user-friendly. Our copy of the Organic Beauty is already dog-eared, what with my daughter looking through it and wanting to try a lot of the recipes. We are having fun with this book, and I'm happy to have discovered a book that teaches us how to make our own beauty products both for our family or to give as gifts. Disclosure: Thanks to the author and Premier Virtual Book Tours for sending us this book for review. We were not compensated in any other way, nor told how to rate or review this product.